The general purpose of the project is getting early feedback for every newly submitted code for Joomla extensions. By creating a fully working environment to run tests for Joomla, so that they can run in a parallel (container-based) environment, increasing speed and coverage of PHP and Joomla versions. The key requirement here is speed, it is crucial to get early feedback on new PRs. In order to achieve this, tests not dependent on each other will be run on different containers simultaneously. The scope of the project is to integrate the Joomla! Weblinks Extension existing tests into the new testing environment. Therefore, pre-installed Joomla containers need to be used in order to be able to run the tests in a short time. The expected results are to automate the testing environment from its creation (by running containers with Joomla/PHP combinations and testing selenium containers), to parallel test execution (by coordination test runs in parallel and taking into account their dependencies) and reporting (storing logs and screenshots for each failed test). In order to run the parallel testing module, make sure you have docker installed and running. On top of that, be sure that the user that will run the project does not need sudo to run a docker command. All the dependencies are loaded through composer and all other prerequisites are loaded in containers by the virtualisation project: memcached, mysql, Joomla PHP servers, selenium servers. The first step in testing the parallel testing project, is cloning its main repository, joomla-testing, on the container-test branch. The only other step is to navigate in its main folder and run composer install. First of all, the purpose of the project is to run the acceptance tests for an extension and in the future to be integrated in a CI tool, such as Travis. Therefore, Windows was not considered for the first iteration of the project, as it can only be used for development and local testing, not production. In order to make the use of the project easy, a single Robo command is needed to run everything. shall be replaced with the corresponding desired extension information. Each of them defining configuration for the database, the Joomla servers, memcached, selenium containers and last but not least, the network they all work on. In order to be easily used in other projects (such as this one), an API has been defined for the virtualisation project. The API expects and environment configuration which is used to extend and override the configuration in the above defined xmls. In this way, all the containers needed for parallel testing are created. The selection list main purpose is to load and maintain the order in the tests needed to be run for an extension. It makes sure that it serves for running only test ready for execution, ensuring their dependencies already succeeded, or marking the task as failed otherwise. A recursive read function has been defined to read the yml file and store the tests data in memory. The data is not normalised, for the ease of future operation, tasks being stored both in a simple list (for the ease of checking their dependencies) and in a map having their flag as key (for the ease of managing the selection process). An exponential improvement in complexity has been made with just a scalar increase in memory (*2). After the read has been done, the next important responsibility of the selection list is to “pop()” tests ready for execution. If there is one task that has no flag and all its dependencies is executed then it is returned, otherwise, “false” is returned. Because all the behaviour of this project (tests run) is async, an isFinished method has been defined. This gives us the information when to write in the logs the overall results of the tests for each selection list, which ultimately represents a server. Tests need to run asynchronous, therefore, in order to keep the information required for their execution, such as the selection lists, a cache (Memcached) is used a persistent storage. Therefore, MainCoordinator queries the cache every time it requires to perform actions on the selection lists and writes the information back afterwards. In order to avoid the concurrency issues, a simple locking system has been implemented. 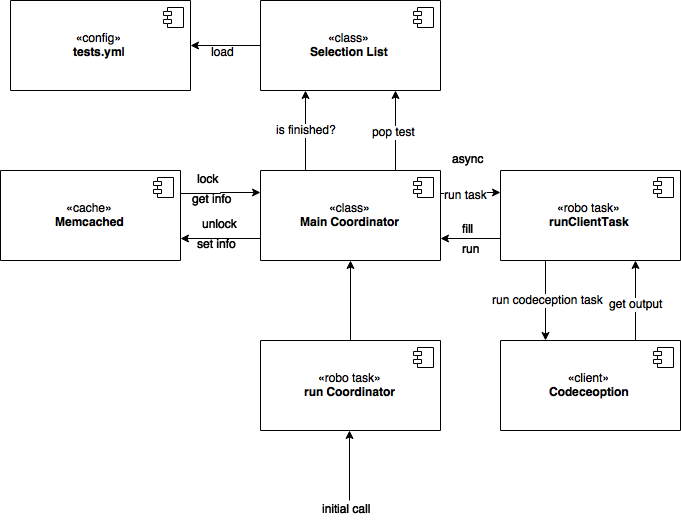 The first responsibility of MainCoordinator is to prepare the data required for tests execution. First, it loads the selection lists, then it creates the runQueue and manageQueue. As discussed in the initial proposition, runQueue stores the tasks that are ready for execution, but in the same time is limited to the number of clients. manageQueue is used to keep the tests coverage balanced across the servers, therefore ensuring maximum efficiency. 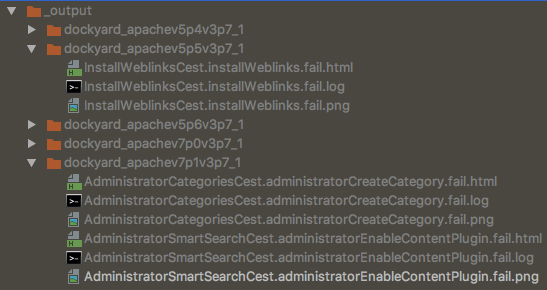 Furthermore, codeception configuration files are created for each server in order to reuse the same weblinks clone and store failed screenshots and logs separately. With the use of the virtualisation API, the testing environment is created and started. Before tests are running, MainCoordinator waits for the database initialisation to finish. Lastly, MainCoordinator is in charge of filling the execution queue and running the available tasks. The filling of the execution queue is done until the maximum capacity is reached, and the tests from the server who last executed one have priority. The running of tasks is performed as long as clients (selenium containers) are available and as long as tasks in the execution queue are available. In order to make the tests async, a robo task had to be created. The execution of a task is basically a “docker exec” command which runs a codeception test inside a client container. The result is then verified and in case of success, the test is marked with the “executed” flag and the whole fill and run flow is reloaded, all async, without knowing the status of the other clients or tests at the moment. In case of failure, an additional log is stored with all the codeception output. In this version, the environment configuration needs to be defined inside the implementation of the robo task, but later it shall be defined externally in order to allow the different needs of testing. This page was last modified on 24 August 2017, at 14:26.